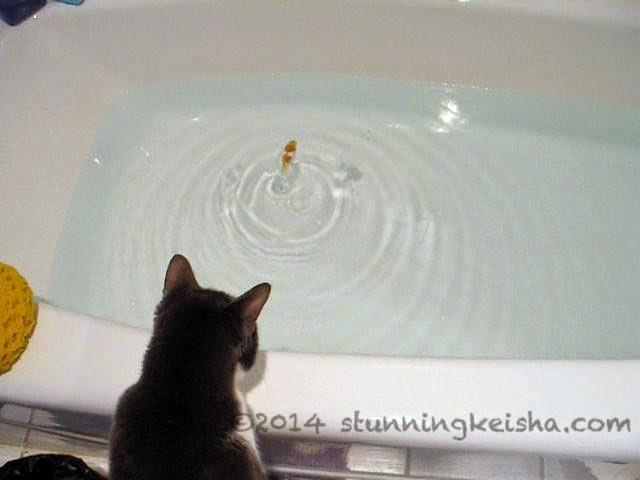 Stunning Keisha: H2 Oh No! Happy weekend, everybuddy! This week, I’m gonna participate in the Saturday PhotoHunt as well as the Caturday Art Blog Hop at Athena’s place. Why did I pick this week to join the PhotoHunt? The theme is Water. 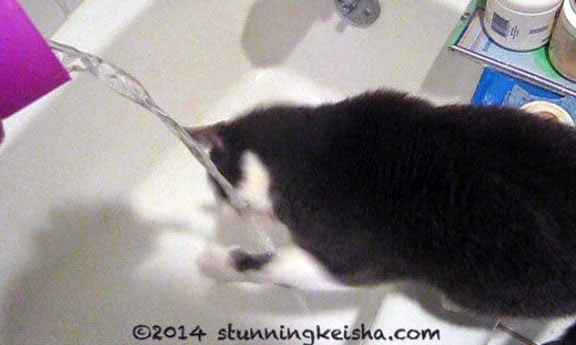 While this kitteh doesn’t actually drink water, I love to play with it as you can see from the photo above. When the condo management tells us they’re turning off our water to fix a leak, TW fills the tub with water. Why she does that is a mystery to me. 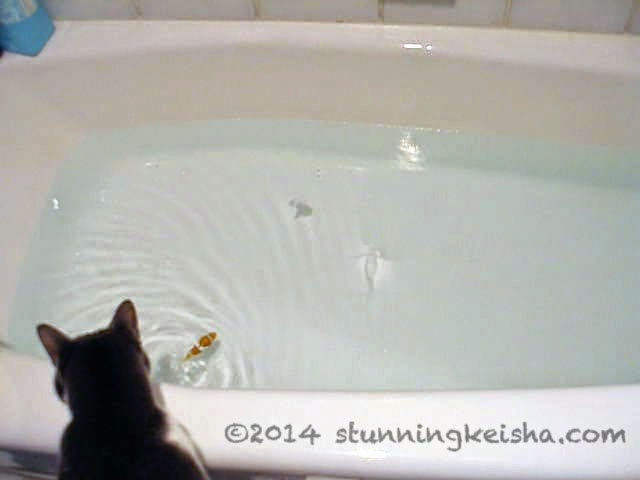 Sometimes she puts my RoboFish into the water. She thinks she’s entertaining me but she’s actually entertaining herself and her flashy box. I will only drink water from my human water fountain. For the Art Blog Hop, I chose a stunning photo and turned it into a panting. Then, so it would fit into the Water theme, I added a reflecting water effect. TW is mesmerized by it and I think it looks cool. Hope you like it too. What are you planning on doing this weekend besides staying DRY? Dat water effect are pretty cool lookin! Wow this is the coolest art image! I love this water reflect effect very much!! So cool Ck loved it. Have a super Saturday. Love the last photo too, COOL !!!! Looking good CK! I almost couldn't see you thought because a crazy pop-up ad kept popping up and wouldn't go away when I asked it to. What a cool water effect! Super cool! How did your get the rippling water effect? Wow... we love that reflection effect! That's a cool pic effect, CK. And we didn't know that you only drank from the faucet. We hardly ever do that. That is incredibly cool, CK! My car Ziggy real has a thing about water. I think he part bangle tiger he will lay in water. Catastic! Don't ya wish you could have your animations on facepoo? Ohhh CK!! The last photo is my absolute fave! Wow, however did you get it to ripple? Love it. That's mesmerizing! I stopped doing Photo Hunt but miss it. Trying to recuperate from an illness. That is one cool pic, CK!!! How did you do that?? CK you are amazing! That is a great water effect!! Oooh that is a cool water effect! Did you make that on Lunapic? Mama uses that sometimes to make pictures of us! Excellent art work CK. You and TW are really getting good at that stuff. I skipped this week cuz M ran out of time to play around - she says anyway. She was probably goofing off somewhere! Hey, I'm feeling a little friskier now--wanna come over and play? That photo SO cool!!! It looks magic! CK you are an amazing CArTist! I admire your sassy and independent nature, we humans must annoy you at times with our inability to always keep up with your high intelligence. We do try to meet our feline's demands, but we are only human after all! What a cool effect of you CK, we love it and we want a RoboFish!